The Scottish military tradition runs deep into Canadian history. They fought as Scots in bonnets and kilts with the British army in the French and Indian War, as Loyalists in the American Revolution, and as Scottish Canadians defending their new native land during the War of 1812. It began in the Highlands, where the people lived in tribal/feudalist clan-based society, living off the fish of their lochs, the deer of their hills, and the cattle of their glens. They were hardy, enduring, and self-reliant, all of which were qualities necessary to make good soldiers. Above all, the Highlanders were loyal to their chief and their kinsmen. Highlanders had served abroad as mercenaries since Roman times, and after the Union of 1707 the British government was able to absorb these brave men into its own military. Lacking the resources or manpower to keep a standing army in the Highlands after the Jacobite Rising of 1715, the British government recruited men from the clans that had been loyal to the Whigs to keep order. These men, however, were unsuccessful in deterring crime, and were especially useless in preventing the favourite Highland pastime, cattle rustling. So in 1725, the government raised a number of kilted independent militia companies - one each from the Clans Munro, Fraser, and Grant, and three from Clan Campbell - to police the territory. Clad in a government-issued black, green, and blue tartan, the scattered, independent companies of the Freiceadan Dubh, or Black Watch, were brought together to form the 42nd Highland Regiment of Foot (later the 42nd Royal Highlanders) under John Lindsay, 20th Earl of Crawford, in 1739. Made to counter the growing surge of Jacobitism in the Highlands, the 42nd Highlanders were formed under the advice of Duncan Forbes, Lord Culloden: "if the Government pre-engage the Highlanders in the manner I propose, they will not only serve well against the enemy abroad, but will be hostages for the good behaviour of their relatives at home, and I am persuaded it will be absolutely impossible to raise a rebellion in the Highlands." 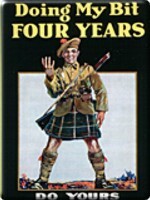 Although the 42nd Highlanders did not prevent rebellion, they were instrumental in putting down the Forty-Five, afterwards remaining in southern England, where they awaited service overseas. When the French and Indian War broke out between France and Britain in 1754, Secretary of State for the Southern Department William Pitt raised two additional line regiments - Montgomery's Highlanders, the 77th Foot, and Frasers' Highlanders, the 78th Foot - to serve in North America with the Black Watch. (Eight other Highland regiments went on to fight on the Continent when the Seven Years' War officially commenced two years later.) The first Scots to fight in Canada, however, were not to be found among these regiments. Many ßmigrß Jacobites had accepted commissions with the French army after the defeat at Culloden. After France ceded New France to Britain in 1763, the 77th and 78th were disbanded, and each officer and soldier was granted land in Quebec according to his rank. Thus the men of these two units formed the nucleus of Canada's first non-French settlers. The British government again turned to the Highlanders for help when the American Revolution commenced in 1775. That June, General Thomas Gage ordered Lieutenant-Colonel Allan Macleon to raise a regiment with two battalions of ten companies each, modeled on the Black Watch. This regiment, The Royal Highland Emigrants, found recruits amongst former soldiers of the 42nd, 77th, and 78th Highlanders, and repelled General Montgomery during the siege of Quebec. South of the Canadian border, other Scotsmen, such as the ones from Strathglass, Glen Urquhart, and Glengarry who had settled in the Mohawk Valley, remained loyal to the Crown. The men of the King's Royal Regiment of New York, The "Royal Yorkers," were given land grants in Upper Canada (today Glengarry and Stormont counties). Their memory is perpetuated in the names of the Canadian militia regiments headquartered in Cornwall: the Stormont, Dundas, and Glengarry Highlanders. The Scots who fought in the War of 1812 were mainly Highlanders living on the banks of the St. Lawrence River. 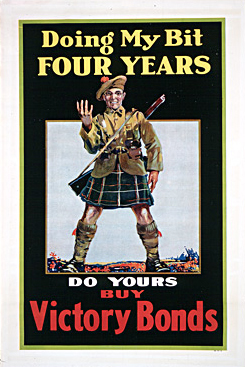 Although the British did not officially raise a Highland unit, the names of the local militias and their commanding officers were telling: there was Lieutenant-Colonel Alexander MacMillan of the 1st Glengarry, Lieutenant-Colonel Allan MacDonnell of Greenfield of the 2nd Glengarry, Lieutenant-Colonel Thomas Fraser of the 1st Dundas, and Lieutenant-Colonel Allan MacLean of the 1st Frontenac. Militias bearing English place names, such as the 1st Hastings, the 1st Essex, the 1st York, and the 1st Grenville, were, moreover commanded by men with surnames like Ferguson, Elliot, Graham, and Fraser, respectively. After the war, a number of Scottish line regiments, including The Royal Scots, the 71st Highland Light Infantry, the 78th Rosshire Buffs, the Glasgow Lowlanders, and the 93rd Sutherland Highlanders, were posted along the border on garrison duty. However, as Canada moved closer to Dominion, the British government began to withdraw its garrison regiments, the last of which departed in 1871. When the government regiments left, volunteer militia units sprang up to take their places. The Black Watch (Royal Highland Regiment) of Canada, the nation's oldest Highland unit, was created in 1862 as a light infantry unit. In 1879, it evolved into a fusiliers unit and adopted Highland doublets and trews in its uniform; four years later, the unit was outfitted entirely in kilts. After the war, the Canadian militia was reorganized, with many regiments being redesignated as Scottish units (for example, the 21st Regiment became the Essex Scottish in 1927). These peacetime militia regiments were mobilized intact when the Second World War broke out, and The Essex Scottish, along with The Cameron Highlanders and The Black Watch of Canada, were the first Canadian Scottish units to see action. They went ashore into a hail of bullets and explosions on the beaches of Dieppe, France, in August 1942. Of the 5,000 who embarked on that expedition, only 2,210 returned. The Germans had taken over 1,900 of them prisoner, while 900 lied dead on the beach. Toronto's 48th Highlanders and Vancouver's Seaforths of Canada of the First Canadian Division landed in Sicily the following year. They were joined on the mainland by the Cape Breton Highlanders of the 5th Armoured Division for the long battle up the boot of Italy before rejoining the other Canadian divisions on the northwest front. "When we read the battle honours of the Scottish regiments which formed part of the Canadian First Army," noted military historian George Stanley in Canada's Soldiers, 1604-1954, "we read, in effect, the battle honours of all overseas regiments. ... These and many other names are today part of Canada's military history, part of Canada's military tradition. ... One of which we can be proud." The Scottish military tradition is an integral part of Canadian heritage. As long as Canadians continue to stand in somber silence as the Governor-General's piper plays a haunting pilbroch at Ottawa's National War Memorial on Remembrance Day, that tradition remains alive.